"Iron Speed Designer saved a lot of time in the development process and allowed us to meet the deadline." In November 2004, California passed Proposition 63 (now known as the Mental Health Services Act or MHSA) which provided additional resources to support county mental health programs. For each of the MHSA-sponsored program initiatives, Los Angeles County Department of Mental Health (DMH) is required to submit to the state a prescribed set of outcome measures designed to enable both agencies to gauge the impact of these programs. Section 2: Social Support of the Baseline Evaluation Wizard. Using Iron Speed Designer, DMH developed an application that allows a clinician to create a baseline evaluation of all clients through an age-specific wizard interface. Each client is asked a series of questions about his or her life within the last six months to one year prior to the first session with the clinician. As the client progresses through the program, the clinician creates a Key Event Change (KEC), evaluations of the time between the baseline and Key Event Change or between Key Event Changes. This allows the DMH and the State to measure the effectiveness of the program. The challenge was to gather and report the state-required data while simultaneously addressing the operational needs of each age-specific DMH program. The application is intended for clinicians and doctors working with DMH in hospitals and clinics throughout the County of Los Angeles. An estimated 3,000 clinicians access this application over the Internet via a secure connection. One maintenance application allowing administrators to modify the dropdown menus throughout the rest of the application. The project's official start date was late November 2005, with a January 1, 2006 deadline. Preliminary design of the application was accomplished in about a week, with frequent requirement changes and modifications. The Iron Speed Designer portion took approximately a month. The code customizations usually were performed within a couple days depending on what was needed, whether the customization had been used before and how it was applied to the application. Some code customizations from prior versions of Iron Speed Designer needed to be modified to be compliant with Iron Speed Designer V3.1. Six people were involved in the development of the application: two analysts who worked on the design, documentation, analysis and testing of the application; three Iron Speed Designer / Visual Basic .NET developers; and one database administrator. Client search with filter and authorization customizations. There were quite a few code customizations added to the application. Some of them came from Iron Speed Designer's Code Customization Wizard, including passing URL parameters across other pages and enforcing application-wide security. Although a lot of code was written for this project, the same code was reused across most of the pages. Due to time constraints, we used one of the design themes that came with Iron Speed Designer and designed a logo with a similar color palette. The primary measure for success was that we created a fully functional application by the January 1, 2006 deadline. Without Iron Speed Designer, this project would not have been feasible due to its size and the frequent requirement changes. A project of this scope would have taken more than a year to write from scratch. Iron Speed Designer saved a lot of time in the development process, and allowed us to meet the deadline. Training for the application began at the end of January 2006. We expect to make modifications based on user input in May and June. Until then, we're porting some of our legacy applications to Visual Basic .NET using Iron Speed Designer. 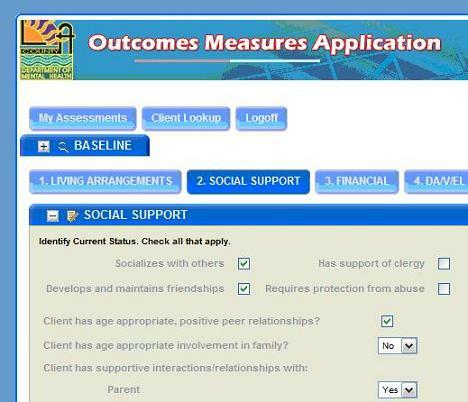 We're also making as-needed changes to the Outcomes Measures application. The state continues to make changes and additions to their requirements, and we need to apply these changes to the application. Without Iron Speed Designer, there is no way we could make the changes as rapidly as required. Robert Rivera has been developing applications for the past six years. For the past year, he has supervised a team of developers and managed Los Angeles County's Database Applications. Robert developed his first application using Visual Basic 3.0, and started developing web-based applications when ASP.NET 1.0 was released. Robert began using Iron Speed Designer Version 1.5 and built several applications between this version and Version 2.0. To bring Iron Speed Designer to his staff and to provide training, he would ask them to rewrite their existing applications in the current version of the tool. This way he was able to teach his developers what he had learned about the new features in Iron Speed Designer while still maintaining the county's existing applications.